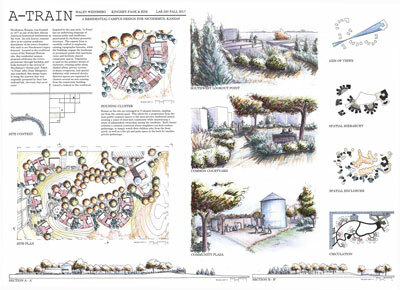 In fall 2017, a group of second-year studio students in the Master of Landscape Architecture and Master of Interior Architecture & Product Design programs in the College of Architecture, Planning & Design came together to apply classroom learning to a local, real-world problem: lack of viable housing and parks in the small Kansas community of Nicodemus. At the end of the five-week project, students proposed a solution via custom tiny homes and programmed outdoor spaces. The project required students to take on the role of designers — considering not just client needs, but also history, context and social issues in community development — and supported the community's receipt of funding to build tiny homes. Founded in 1877 by a group of African-American settlers moving north and west, Nicodemus is the only continuously settled African-American town west of the Mississippi River. The town contains a National Historic Site, overseen by the National Park Service. During the late 1800s, city life was vibrant and the population grew. However, with the loss of railroad access — essential to growing western towns — the Great Depression and the Dust Bowl beginning in the 20th century, the population dropped significantly and community life suffered. Despite community members efforts starting in the 1970s to restore and revitalize the community, it has remained a challenge to keep the settlement economically viable. A lack of housing discourages retired descendants of Nicodemus' families from moving back to the community. Annually, the community attracts hundreds of people to its Homecoming Celebration, but these family members and visitors have very few accommodations at the townsite. In recent years, however, community members have started looking for a solution to this problem, and thus the Nicodemus Residential Campus of Small Homes originated. Specifically, the community has sought to construct small or tiny homes that can be used by a diverse range of occupants, from retirees, artists-in-residence, writers and historians-in-residence — to tourists and visitors to the historic site that may desire Airbnb-type lodging. For the Nicodemus Residential Campus of Small Homes, students learned firsthand about community needs and goals from JohnElla Holmes and Angela Bates, two dedicated Nicodemus locals who have deep local knowledge and scholarly understanding of their town's story. Students then worked in interdisciplinary teams to propose an overall site design: a compact residential campus of small homes, community buildings, and outdoor spaces. The creative and inspiring proposals incorporated ideas from precedent study and the needs of the Nicodemus community. Illustrations from the students' work were used in the Nicodemus community's application for a Dane Hansen Foundation Grant of $120,000 that was awarded in February 2018. The grant will help fund the building of tiny homes for those that will move to or visit the Nicodemus community, and may create opportunities for students to serve as interns. The Nicodemus Residential Campus of Small Homes came about via an interdisciplinary collaboration on similar projects between landscape architecture and regional & community planning and interior architecture & product design starting in 2011. The initial collaboration involved professors from both departments: landscape architecture and regional & community planning professors Lorn Clement and Katie Kingery-Page with teaching assistant Jeremy Merrill, and interior architecture & product design professors Katrina Lewis and Will Yankey for the La Reyna Cooperative in Nicaragua. Lead faculty on the current collaboration, Nicodemus Residential Campus of Small Homes included Lewis and Neal Hubbell from the interior architecture & product design department and Hyung Jin Kim and Kingery-Page from the landscape architecture and regional & community planning department. Special thanks for making the project possible goes to community partners Holmes, a Nicodemus resident, and Bates, the director of the Nicodemus Historical Society, and guest lecturers including La Barbara James Wigfall in the landscape architecture and regional & community planning department.